Although it’s still taboo in many parts of the country, the pillars of cannabis prohibition are falling in the United States. As a result over half our nation now has medical cannabis laws. Discussions of the potential benefits of cannabis are occurring across generations – grandmothers with granddaughters and sons with fathers – as we openly discuss the potential therapeutic benefits of the plant without fear of judgement. In this new health & wellness section I’ll bring information to the readers of Stoner Magazine about the plant in an effort to demystify what many would say is the most medicinal herb in the world. This issue’s topic is on terpenes or essential oils in cannabis. It isn’t the THC or the CBD after all that makes the flowers smell when they are close to harvest – it’s the aromatic terpenes as the flowers ripen. Beyond odor, terpenes play several roles, including protecting the cannabis plant against predators like insects and animals. Terpenes are found all over the plant kingdom and are a large class of naturally occurring organic compounds that contribute to plant resin and essential oils. Over 120 terpenes have been found in cannabis – many of them have medicinal benefits and have been scientifically studied in other plants. 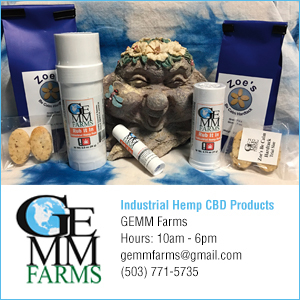 The primary terpenes we’ve found in cannabis plants grown in Southern Oregon are limonene, also found in citrus; myrcene, also found in hops and mangos; pinene, also found in rosemary; linalool, also found in lavender; caryophyllene, also found in black peppercorn; and elemene, often found in mint. At Breeze Botanicals in Southern Oregon we require terpene testing on all dried cannabis flowers to help us, as herbalists, understand the potential therapeutic benefits of a particular batch. Myrcene is one of my favorite terpenes to share with customers interested in learning about cannabis. Myrcene works to breakdown the blood brain barrier to allow better absorption of whatever you put in your body. We can use mangos, a plant high in myrcene, as an example. Many people say that if you eat a mango an hour before you take your multivitamin or fish oil pill the myrcene helps allow for better uptake of the vitamins vs elimination. What this might mean in cannabis is that a batch that’s high in myrcene may leave you feeling more of the psychotropic effects of THC as your body can absorb more due to the myrcene. This could be good or bad depending on your desired use of the herb. Too much THC might leave you feeling too “stoned” or bring on a cannabis induced anxiety attack. However, some people suffer from intense pain or suffer from loss of sleep and may find the relief they need with the assistance of higher myrcene. Of course, cannabis has lots of different cannabinoids beyond the famous THC, but this is a good example to use here. In summary the myrcene terpene offers many therapeutic effects and can assist the other cannabinoids in absorption. Although Oregon legalized medical cannabis in the late 1990s, we are just now embracing the herb as a culture and exploring its potential therapeutic benefits openly as a community – not in fear – as a result of full legalization. As we explore the many facets of cannabis from the primary constituents, better known as THC & CBD, to minor cannabinoids, flavonoids, and terpenes we learn and we share. Embrace the whole-plant and all her herbal greatness, because once we truly get to know her, the taboo melts and news spreads to our neighbors and then their neighbors, till prohibitionists have no foundation left to stand on…then the plant will be free. This article contains information about herbs, including cannabis, and is for general health information only. This article is not to be used as a substitute for medical advice, diagnosis or treatment of any health condition or problem. Readers of this article should not rely on information provided here for their own health problems. Any questions regarding your own health should be addressed by your own physician or other healthcare provider. A self-taught herbalist, mother, and entrepreneur, Brie Malarkey is the founder and CEO of Sun Breeze Inc., a seed-to-sale cannabis company from Southern Oregon. A self-taught herbalist, mother, and entrepreneur, Brie Malarkey is the founder and CEO of Sun Breeze Inc., a seed-to-sale cannabis company from Southern Oregon. Sunna Ra Acres, her medicinal herb farm, in Shady Cove grows cannabis and other medicinal herbs side-by-side. Her dispensaries, Breeze Botanicals in Gold Hill and Ashland, Oregon were the first Oregon state licensed retailers and focus on plant medicine that is, cultivated and wild crafted, or indigenous to Southern Oregon, including medical cannabis. Her product company, Sun God Medicinals, works to blend herbal allies with cannabis to help people address specific symptoms. By displaying and blending herbs in symptom relief categories like sleep aids, digestive aids, mental ease, muscle ease the company works to demystify medical cannabis and other medicinal herbs that work synergistically with cannabis.